Thank you for choosing Her Ladyship,offering women and couples sailing courses around the globe. Captain Jennifer MacLean is a certified ASA sailing instructor and currently holds a US Coast Guard 100-ton Near Coastal Master’s license with Sailing Endorsement. She has been working as a sailing educator and charter yacht captain since 1999. She specializes in women’s, couples and youth sailing programs. She worked as a captain with the Boy Scouts of America for ten years in their live aboard sailing adventure program (Florida National High Adventure Sea Base) and has lived aboard her own boat for 12 years. She has been featured in different articles and magazines including Latitude and Attitude, La Vie Claire, Waterfront News, Bearings and is also featured in a coffee table book called Women and the Sea. 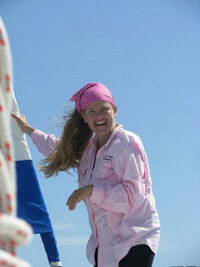 Jenn has extensive coastal and blue-water sailing experience, including an Atlantic Ocean crossing in 2006. She has also sailed in the Chesapeake Bay, the Bahamas and the Caribbean. Jenn is fluent in French, English, and Spanish and enjoys singing and playing guitar.